Symptoms are your body's way of telling you something isn't right, and tinnitus—a ringing, buzzing, clicking, or whistling sound in your ears that's not related to anything external—could be the result of a migraine. Scientific research on this points to a state of heightened sensitivity as a possible reason for this potential connection, though there may be others. Ear ringing or buzzing is actually a common experience, affecting about 10 percent of the population. There are around 200 distinct health conditions that can cause tinnitus, according to the American Tinnitus Association. Some common ones include age-related hearing loss, severe nasal or sinus congestion, excessive ear wax, temporomandibular joint (TMJ) disorder, and head and neck trauma. Though not common, there are some serious causes of a combined headache with tinnitus like carotid artery dissection, a tear in the wall of your artery, or a traumatic brain injury, so it's important to have your doctor rule these out. You may be wondering how your tinnitus (an ear problem) relates to your migraines (a brain problem). Here's what the research shows. One study found a link between tinnitus and migraines in 1,645 French students with migraines. This means that the study participants with migraines were more likely to also have tinnitus than those without a history of headaches. Interestingly, the link was stronger for those who suffered from migraine with aura than from migraine without aura. Furthermore, a 2018 study found that having migraines was associated with a more than three times higher risk of developing tinnitus. Migraineurs were also found to have nearly three times higher risk of developing other cochlear disorders than those without migraines. 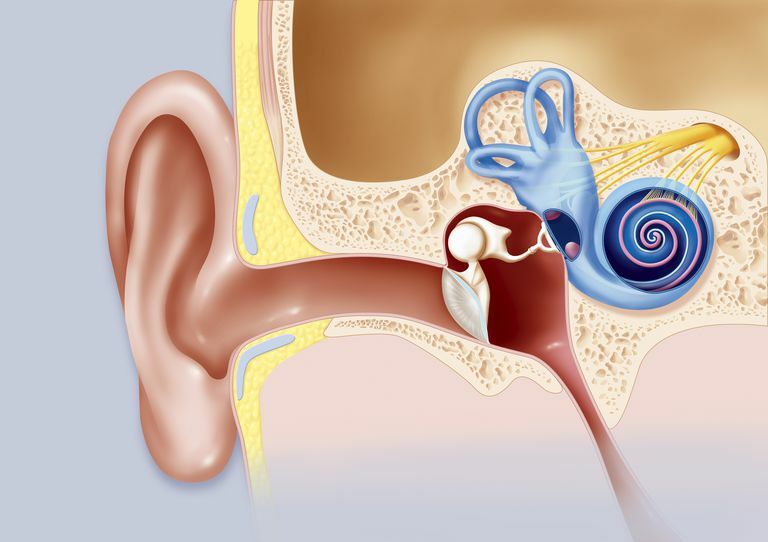 The researchers theorized that this link could be caused by a process in the brain instead of a problem with the cochlea. Another study sought to further understand the relationship between migraine and tinnitus by looking at nearly 100 participants with tinnitus and migraines. The researchers found a significant association between tinnitus and headache laterality, meaning that a person with tinnitus in the right ear tended to also have their head pain on the right side, and the same went for the left side. In addition, the severity of tinnitus and headache coincided in about half of the participants. So when their head pain became more severe, their tinnitus did too, and vice versa. The authors of the study suggest that central sensitization may explain the tinnitus-migraine link. Central sensitization occurs when your brain and spinal cord develop a heightened sensitivity to both things that should hurt, like a needle prick, and things that shouldn't hurt, like a regular touch. In migraines, scientists believe that pain fibers that originate from the trigeminal nerve, which is the largest cranial nerve, release inflammatory peptides like substance P and calcitonin gene-related peptide (CGRP). These peptides, along with the widening of blood vessels that surround the brain, could cause the throbbing pain associated with a migraine. After repeated migraine attacks, central sensitization may occur, which could be the trigger for the development of tinnitus. On the other hand, it could be that tinnitus in one ear sensitizes the trigeminal nerve system, resulting in migraines on that same side of the head. It's hard to know for sure at this point, although research shows that headaches tend to precede tinnitus, so the first theory may be more plausible. Or there could be a totally different factor that we don't know about yet that's triggering both the migraines and tinnitus. All in all, experts aren't sure yet why there's a connection between migraine and tinnitus. Regardless, research suggests the combined occurrence of head pain and ear ringing likely has a biological basis. In other words, it's not just a coincidence. Like any symptom, tinnitus can affect people in different ways. For some, it may be just a mild annoyance, while for others it can be quite debilitating and contribute to social isolation, increased stress levels, sleep disturbances, and anxiety. The good news is that if you have tinnitus, it can be effectively treated. The treatment strategy your doctor chooses will ultimately depend on your unique case and what's causing your tinnitus, so what works for someone else may not be right for you. An effective migraine treatment plan may help this symptom. If you have tinnitus and migraines, the science thus far indicates that there's a link, possibly central sensitization. What this means for you is hard to say, other than that treating one may help the other, especially if the therapy targets the shared mechanism of how your migraine and tinnitus developed in the first place. Research also shows that having a headache disorder, like migraine, can play a big role in how tinnitus impairs your quality of life. So even if treating your migraines doesn't lessen the physical burden of your tinnitus, it may lessen the psychological toll the tinnitus takes on your everyday functioning. Bernstein C, Burstein R. Sensitization of the Trigeminovascular Pathway: Perspective and Implications to Migraine Pathophysiology. Journal of Clinical Neurology. 2012; 8(2):89–99. doi:10.3988%2Fjcn.2012.8.2.89. Guichard E, Montagni I, Tzourio C, Kurth T. Association Between Headaches and Tinnitus in Young Adults: Cross-Sectional Study. Headache. 2016; 56(6):987–94. doi:10.1111/head.12845. Hwang JH, Tsai SJ, Liu TC, Chen YC, Lai JT. Association of Tinnitus and Other Cochlear Disorders With a History of Migraines. JAMA Otolaryngology-Head & Neck Surgery. 2018;144(8):712–717. doi:10.1001/jamaoto.2018.0939. Langguth B, Hund V, Busch V, et al. Tinnitus and Headache. BioMed Research International. 2015;2015:797416. doi:10.1155%2F2015%2F797416.